Niall: I picked out “Sense and Sensibility” as a starting point for this discussion because it seems to me the closest Benjamin Rosenbaum comes to having a signature story, in terms of the number of boxes (favourite themes, subjects, techniques) that it ticks. This perhaps means it contains much more than any single story should ever try to contain – or alternatively, is pure ADHD fiction; whatever it is you’re not enjoying about the story will probably stop in a paragraph – and is always threatening to fly apart at the seams. It’s also referential (to Austen, Barth, and whoever it was wrote the original sf story about living on the flanks of an enormously larger creature – I want to say Damon Knight); metafictional; extrapolative of its implications; witty; and silly. I think silliness is what holds this particular story together, actually. Rosenbaum can get away with a lot through sheer cleverness and technique – for example, his ability to control, and therefore anticipate, his reader’s response is what carries off a lot of the metafictional asides. And he orchestrates the various elements of his story to create thematic parallels and resonances almost too precisely (or at least almost too explicitly). And he seems to have access to an almost inexhaustible well of inventiveness. But the silliness prevents the story from feeling self-indulgent, or coldly controlled – even when it’s silliness that’s reinforcing one of the story’s core themes. I’m sure, for instance, that in a story about the interaction between the “sense” (meaning) of a story and the “sensibility” (reading protocols) of its readers, and given what happens a sentence later, “Miss Dashwood collapsed upon an Ottoman, sobbing” is meant to recall “he turned on his left side” as an example of a sentence whose sense depends on the reader’s sensibility; and that could be horribly po-faced, but is in fact done as a horrible, groan-inducing pun. There’s so much going on in “Sense and Sensibility” that I can’t help but find the process of reading it exhilarating, and on more than just a purely intellectual level. And that goes for the best of the rest of Rosenbaum’s fiction, too. I think The Ant King is a flawed collection, but the flaws are almost all on the level of the collection, and very rarely on the level of the individual story. Abigail: It’s precisely Rosenbaum’s expansiveness that has me uncertain about whether I like the story. On the one hand, you can’t help but admire an author who tries to do so much and with such insouciance. On the other hand, the pieces get somewhat lost in the whole. Unsurprisingly, I read this story concentrating on the Austen parody, and there’s a lot of meat there — Regency characters, with period-appropriate attitudes towards sexuality and proper relations between the sexes, whose lives are thrown into disarray precisely because the creature they live on has modern attitudes, of which they are aware. That’s not even to mention the interaction between the Dashwoods’ cool Austen-ish attitude (even Marianne and Mrs. Dashwood) and the more gothic sensibility they encounter once they reach the mouth (which reminded me, perhaps inevitably, of Kessel’s “Pride and Prometheus”), and the fact that the story compares the insular world of Austen’s novels with the perhaps similar insularity of fantastic worlds. But in concentrating on that aspect of the story, I can’t help but feel that I’ve ignored others, and perhaps missed out on the whole. It’s not necessarily a flaw — I agree with Niall that the story is exhilarating — but it does make the story hard to discuss. I was a little meh about the metafictional asides. Though it’s clear that Rosenbaum doesn’t truly expect us to forgive “Sense and Sensibility”’s metafictionality just because he’s hung a lantern on it, I can’t help but wonder if he isn’t trying reverse-reverse psychology — if a writer pointing out his own story’s metafictionality is tired and pretentious, then doing it egregiously cancels out that pretentiousness, and achieves the effect of getting us to swallow the metafictional asides without feeling that we’ve been pressured into it. If that makes even a little bit of sense. As for your definitions of “sense” and “sensibility” — Hmm. Hmmmmmmm. I mean, it’s probably not significant that this not how Austen uses sense and sensibility, and it’s not that this approach doesn’t make sense. I’m just not sure I see that the story encourages it. Lastly, I’m not sure what you mean by flawed on the level of the collection. How does that work? I’d call The Ant King uneven — half stories I really liked and half I didn’t have much time for — but that doesn’t mean there aren’t flaws in individual stories. But the startling “Red Leather Tassels” atones for the collection’s filler material. The story begins with a captain of industry losing his shoes, continues with the businessman being lifted into the air by a flock of pigeons, and concludes with an adulterous affair between the robber baron’s wife and a woodpecker. It’s a testament to Rosenbaum’s talent that such an unusual premise offers an unexpectedly touching conclusion. Now, “Red Leather Tassels” wouldn’t be in my top ten from the stories in the collection. Is it just the sort of collection where everyone’s going to have a different favourite? I’m imagining some kind of online test … WHAT YOUR FAVOURITE ROSENBAUM STORY SAYS ABOUT YOU! Though gifted with an insightfulness and candor suitable to a matron of advancing years and declining income, Mrs. Dashwood was generous, sympathetic, impatient, irregular, bashful, imaginative, dramatic, modest, fanciful, clandestine, opportunistic, prudent, celebratory, prurient, madcap, ostentatious, retiring, whimsical, and toothsome, qualities that her marriage and its subsequent devolvement into tragic farce (joined to the propriety and calmness of her instincts) had rendered sadly irrelevant. This is just waffle — replace half the adjectives with entirely different ones and the sentence remains the same. The only thing that gives it the illusion of meaning is the fact that the prose style parodies Austen, so because Austen’s convoluted sentences made sense you are tricked into thinking Rosenbaum’s do. And you only need to read this paragraph once, not have it seemingly endlessly repeated. If the silliness is meant to be a refuge for the reader then it is too uniform to actually be leavening and ends being extremely tiresome. Then another three paragraphs later we get the first straight-to-reader bit and I completely hit a brick wall. I like Abigail’s description of this as being reverse-reverse-psychology. Dan: Martin is exactly right. Niall argues that Rosenbaum’s flightiness is his great strength, that because you know the next page will have something entirely new for you, it doesn’t matter if the current page is rubbish. This is such nonsense that it barely requires noting: I do not enjoy my half hour of The World’s Worst Doctors because I hope the next half hour of Eastenders will be better. Rosenbaum’s key weakness is his absolute inability to find a theme or story and stick to it. Again, the paragraph from “Sense and Sensibility” which Martin quotes is an obvious example of a total insistence on form over content, on tricking the reader into thinking what they’re reading is clever when in fact it is simply marking time until the next sleight of hand. Abigail’s point that Rosenbaum’s ubermetafictionality is a ploy to short-circuit his pretentiousness gets to the heart of his hollow trickery: he isn’t clever, merely big. In this way, Ed Champion’s appreciation for “Red Leather Tassels” is actually understandable. It does manage simultaneously to pop with ideas but also hang together as a story. Its turns are at right angles, for sure, but they are not, I think entirely unconnected. 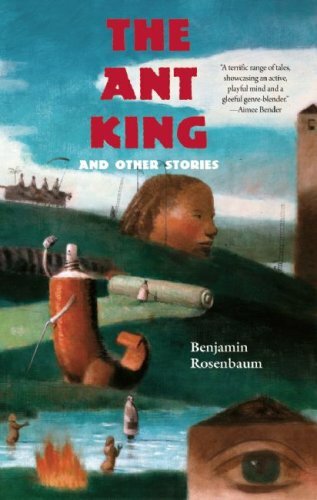 Likewise, though “The Ant King” is hardly Saki, it does succeed in allying Rosenbaum’s love of the vignette with a theme strong enough to carry the required weight. One of the strongest stories in the collection, for my money, is “Start The Clock“. Like the others, it doesn’t rewrite its chosen mode, but its profusion of images is carried along by a happily disjointed narrative and a point or two which manage to hit home. On the other hand, a story like “Biographical Notes” teems with concepts and episodes, but grows quickly tiresome in its failure to cohere. What it thinks is Boy’s Own lurching from incident to incident is in fact merely the sign of an author having more fun than his reader. And, again, Rosenbaum relies on the pastiche style to wink his way out of things. Surely this isn’t enough? Niall: Given my lack of appreciation of Austen, I didn’t pick up on half of what Abigail did about the referentiality of “Sense and Sensibility” in that direction (though I assumed it was there). But I’m pretty confident that the story does indeed encourage other interpretations of its title, and specifically the one about genre protocols that I suggested. I’d say it’s one of the big things the metafictional asides are doing, actually. The very first time the narrator addresses us directly, it (he?) talks about whether the story is doing what we expect of it, speculating on our readerly sensibility: “Perhaps the quasiplastic penumbrarium has piqued your interest”, and so forth (which, of course, in my case, it had). And there’s a lot about people saying what they mean, or not, which brings out the “sense” of the story – the puns, of course, but also the conversation which is “conducted entirely in impenetrable euphemism”, for which the subtext is transcribed, or when Miss Dashwood speaks a ridiculously convoluted sentence and Mrs Dashwood takes “a necessary pause to reflect upon her daughter’s syntax”. If you like, the story marries Austen’s fascination with social protocols with a fascination with reading protocols. I’m confused by Martin’s criticism of that list as waffle. Of course it’s waffle: that’s the punchline of the paragraph, that this extravagant list of qualities is “sadly irrelevant”. Similarly, Dan’s comparison to TV is misleading; on the one hand because a lot of people regularly invest time in series television on the understanding that the quality of individual episodes will vary, and on the other because spending half a minute reading a page of prose is hardly a comparable investment to spending half an hour watching World’s Worst Doctors. I don’t feel “tricked” by the paragraph Martin quoted; I feel amused to a level not disproportionate with the time it takes me to read it. Similarly with my disappointment when it’s a paragraph I think doesn’t work. Looking at Dan’s other criticisms, it strikes me that we are looking for entirely different rewards from Rosenbaum’s stories. “Red Leather Tassels” does indeed hang together as a story, but for me that is all it does; it did not particularly inspire or amuse or impress. “The Ant King” feels somewhat second-hand — I’ve said before that I find the combination of pop culture and deadpan tone feels too in thrall to Kelly Link – whereas I can’t see anything tiresome about “Biographical Notes”. I’ve read it four times now, and each time it has seemed both coherent and fun; or rather, I think it’s clear that any “failure to cohere” is entirely deliberate, since the story is an extended argument with the way we construct narratives around events. I fail to see what is hollow about that. The furthest I can go towards agreeing with Dan is to say that it is almost impossible to make general statements about Rosenbaum-the-writer on the basis of this collection, except to say that he likes to play. But so what? The fact that we can’t agree on which experiments work and which don’t hardly seems an adequate criticism of his drive to experiment. And there are plenty of other writers who demonstrate a similar fickleness – David Mitchell comes to mind. I do think there’s an argument to be made that the way the stories in The Ant King are sequenced doesn’t prepare you adequately for what follows, which is what I meant by the book having collection-level flaws; “The Ant King” strikes me as too tame to make a good opener, and liable to cause disappointment if it becomes the standard against which the rest of the collection is compared (I, at least, have a tendency to take opening stories as in some way being statements of intent). Were I introducing someone to Rosenbaum, I would probably tell them to read “Biographical Notes” first, and “Other Cities” last, since they seem to me a much better pair of bookends for the range of what his stories attempt. I think you are too harsh on “The Ant King” because I don’t think it has a overpoweringly specific debt to Link. It is more of collision between the new wave fabulist school in general and gonzo-tech Doctorow/Stross axis. Obviously this is a terrible idea, but the story doesn’t fail because it is a poor imitation of Link, it is much more individual than that. Besides, you say the mix of pop culture and deadpan prose is inherently Linkian but she dials the pop culture stuff way down low and Rosenbaum’s prose here is not what I would call deadpan, it is too glib, you can see his mouth turning up at the corners. There is a connection between the two but it isn’t as strong as you make out (and it doesn’t overdetermine how I view the rest of the book). I like “Red Leather Tassels” because its silliness is not inordinately overextended like “Sense and Sensibilty”, nor is it too pleased with itself like “The Ant King”. Like Champion I think it makes a welcome contrast to the aimlessness on display elsewhere in the collection. One of the strongest stories in the collection, for my money, is “Start The Clock”. Dan Hartland in preference for conventional SF shock! Abigail: It seems to me that, when it comes to “Sense and Sensibility,” Martin and Dan are assuming that the story’s ADD-esque flitting from subject to subject, style to style, and excessive game-playing, are all that it amounts to, whereas Niall and I are trying to find some unifying theme or point. I’m not saying that we’re right and you guys are wrong — it’s probably telling that we’ve each come up with a different interpretation which is rooted in topics we found interesting before reading the story — but I do think the story achieves the effect of suggesting that such a unifying element exists, which I find compelling in itself even if this suggestion is false (Donnie Darko and Magnolia both get a lot mileage out of this suggestion of a greater meaning). Not to drag us back into the question of whether Rosenbaum’s writing is Link-ian, but I kept thinking of “Magic for Beginners” when I read “Sense and Sensibility.” On the one hand, this is an unfortunate comparison, because Link’s story is a great deal better than Rosenbaum’s, but I do think that “Sense and Sensibility” comes close to doing what “Magic for Beginners” does, which is to create, from disparate, ill-matching, and nonsensical pieces, a whole that is, though not coherent, at least cohesive. Again, the paragraph from Sense and Sensibility which Martin quotes is an obvious example of the writer’s total insistence on form over content, on tricking the reader into thinking what they’re reading is clever when in fact it is simply marking time until the next sleight of hand. Abigail’s point that Rosenbaum’s ubermetafictionality is a ploy to short-circuit his pretentiousness gets to the heart of his hollow trickery: he isn’t clever, merely big. And now to contradict myself: though the ubermetafictionality (love this word) left me cold, in general I don’t think that “not clever, just big” is necessarily an indictment of a writer. A brazen author can sometimes get away with far greater flaws than a more competent but also more timid author might, simply by virtue of having the balls to go completely off the deep end. “Sense and Sensibility” does this. So does “Biographical Notes,” which holds on to the courage of its convictions all the way to its end. Stories like “Red Leather Tassels” or “The Ant King,” meanwhile, are perhaps more technically accomplished and coherent, but in terms of theme I didn’t find them any more resonant than it was, and so the relative modesty of their surrealism becomes their undoing. Or, to put it another way: why I liked The Book of All Hours and you didn’t. This is what I think makes Rosenbaum’s flightier stories ultimately hollow. Niall suggests that the failure to cohere is deliberate, and that therefore there is no hollowness. But, again as Martin points out, if the pay-off isn’t enough then the reader will still find that deliberateness tiresome. A deliberately incoherent story is still incoherent, regardless of the meta piled on top of it, as if to apply downward pressure on the text itself. The illusion that the vignettes stick together is thus artfully created, but it remains a trick rather than the real thing. In this sense, Niall is right about one thing: that Rosenbaum is indeed merely all about the playfulness. There’s nothing else of any weight to him. Abigail boils all this down: if the reader is willing to prise ambition over craft then they will like Rosenbaum; if they are not, they won’t. I don’t see the different between an incoherent story and a coherent story with similar thematic resonance, except that one is coherent and the other isn’t. If you’re interested, as Niall is, in generic reading protocols, then perhaps there is something in incoherent metatextuality to get your juices flowing. But otherwise you have a choice between two stories with not half as much thematic insight as they’d like to have, but one that has a plot where the other doesn’t. The only line I’m willing to throw Rosenbaum is one labeled “dissolution”. Time and again in his stories, the old encounters something different, destroys itself to assimilate it, and creates the new. The flux and confusion in his stories mirror that of his worlds. Rosenbaum is perhaps interested less in the coherency of his stories than he is in the incoherency of existence. Whether or not this excuses his failings is obviously down to individual taste! Niall: There are a whole pile of things in Dan’s last email that I’d be inclined to press a bit further on. Rosenbaum’s use of metafiction is “not sufficiently weighty”? I disagree with that on general principle; if we start down the road of only assigning worth to those fictions which deal in Serious Topics, we’re going to exclude a lot of very good and enjoyable and admirable fiction from the ranks of the worthy. And to suggest that certain techniques are only allowed if they are counterbalanced by a seriousness of topic is patently ridiculous. “The House Beyond Your Sky” is not a good story with metafictional elements because it portrays abuse, it’s a good story because the metafictional elements and the elements of abuse are handled well. Similarly, Dan talks of Rosenbaum’s stories being “tricks” rather than the “real thing”: what, exactly, is the “real thing” when we’re talking about a short story? A deliberately incoherent story may encourage us to find enjoyment in incoherence. I second Abigail’s discussion that we shift the topic somewhat, to consider the more traditionally science fiction and fantasy stories; I think perhaps another way of parsing her descriptions of them as “conventional” and “grounded” is to say that they do not trade in the same incoherence that “Sense and Sensibility” does. To continue talking about “The House Beyond Your Sky”, which I think is one of the best stories in the collection, one of the things that sets it apart for me is that I find it very hard to reduce, to summarize in any way that doesn’t do damage. It strikes me as the epitome of coherence, in fact, every element reinforcing every other; the shifts in this one between abstraction and personal detail feel seamless, as do the juxtaposition of radically different kinds of detail (“sodium and potassium” vs. “button nose”, for instance.) It’s a textbook example of finding a sense of wonder in the small. Of the others Abigail mentioned, I find “A Siege of Cranes” relatively unsatisfying precisely because, as she hints, it retains elements of unconventionality. Something I didn’t realise the first time I read it is how well it sits in a tradition of Moorcockian epic fantasy, with the compression of events into a short story frame … except that the humour Rosenbaum uses continually breaks the immersive aspects of the story, in a way that for once doesn’t feel intentional. “Embracing-the-New” seems to me interesting as a story that can be read either as sf or as immersive fantasy (it reminds me somewhat of Tiptree’s “Love is the Plan the Plan is Death” mashed up with Stross’s “Tourist“), and because I think it generates quite a substantial emotional weight in relatively few pages. And I’m intrigued that Dan listed “Start the Clock” as one of the strongest stories, and would like to know why; not that I don’t think it’s good, but it struck me as more of an outline for a story than a full story – in contrast to, say, “Falling”, which packs an incredible amount into its two pages. I’ll end with a question: do Martin and Dan think it is even possible to reconcile the breadth of references that Rosenbaum attempts to reconcile throughout this collection? Do your objections boil down to thinking he should just pick a style and work in it? Dan: I think Niall’s banging the wrong drum here. It’s not that Rosenbaum’s use of metafiction isn’t weighty, it’s that the stories onto which he bolts his meta simply aren’t strong enough in the first place. My argument simply is that, however well executed this particular technique is, its explicit status above the story renders it particularly susceptible to being left high and dry by a weak story. In this way, it’s not that metafiction is “non-serious”; it’s not even that the stories are non-serious, though in trying to add substance to themselves through metafictional trickery they certainly hold themselves open to accusations of bald pastiche; it’s that, even as non-serious stories, they don’t quite work. And no amount of oh-so-arch metafiction can rescue them from that. Niall’s right in saying that a great story can very easily be a light and fun story. Rosebaum’s are neither, regardless of his cleverness. I’m only interested in the meta if I’m interested in the fiction. It’s been suggested that the fictions in this collection are deliberately incoherent; so it may be. But deliberate inocherence is a coherence of a stripe. In don’t detect much in terms of even that in Rosenbaum — his is a scattergun approach to the short story, and inevitably each of his attempts at the art miss as much as they hit. Abigail: OK, but this seems to be starting from the assumption that metafiction is solely a technique, a means to an end rather than an end in its own right. I don’t disagree when you say that some of the stories in The Ant King are weak and substanceless — though I’d count “Red Leather Tassels” in that group — but in the case of a story like “Sense and Sensibility,” and despite the fact that I found the metafictional asides manipulative, I thought the less obvious metafictional aspects of the story actually added substance to it and helped knit together a fractured plot. Dan: In one sense, Niall and I do agree: “The House Beyond Your Sky” is one of the very strongest stories in the collection, not because it is Serious or Grounded, but because it is a finished, rounded artifact, very much its own thing and irreducible. Sadly, elsewhere Rosenbaum too often falls back on distractions, sleights of hand and tipped winks. I’m not sure this means SF is Rosenbaum’s strength — merely that it may impose upon him an external discipline. He’d be a fine writer if he could find his own internal discipline to match: not so much pick a style to stick with, as draw in his many influences more tightly. Martin: I’m confused by Niall’s use of the word “reconcile”. I’m not sure Rosenbaum attempts to reconcile his grab bag of stories in way I am familiar with, and the fact that he doesn’t makes no difference to me. I don’t dislike the collection because it isn’t cohesive — I admire it for this. I just happen to dislike one particular recurring part of it, his laboured postmodern schtick. Moving on to the “straight” stories. They don’t put me off but they don’t particularly entice me either. “Start The Clock” is the Stross/Doctorow half of “The Ant King” that I refered to before. Heartland stuff. I liked “Embracing-the-New” without ever getting excited about it but I’m not sure what is interesting about the fact that it can be read as either SF or fantasy. This is true of a large class of stories, what we might call the indistinguishable from magic set, and it makes no difference. Multiple valid readings are only interesting when they allow you to read the same story in different ways whereas whether it is SF or fantasy you still read the story in the same way. I recently read “Bright Morning” by Jeffrey Ford which I thought made an interesting contrast with “Biographical Notes”. (Even the comparison between the two titles is slightly illustrative.) Ford’s story also features a character with his own name as well as a narrator who is also (to some extent) him, but it is carried off with a grace that makes Rosenbaum’s story seem crude. When Dan talked about prising ambition over craft, here is a story that shows you can have both. I don’t especially prize ambition on its own. I don’t want to have to read The Book Of All Hours again. It is true that control isn’t everything — there is more than one way to skin a cat and sometimes it nice to read something completely off the wall — but I do think The Ant King is a collection that is often lacking restraint in the worst possible way. The exception is the one story we seem to be agreed on, “The House Beyond Your Sky”, which I liked a great deal for the same reasons that Niall outlines. Along with “Red Leather Tassels” it is one of the few times Rosenbaum strikes the right balance and shows what a good writer he is. Niall: I’m taking Dan’s answer as a “yes”. I think. Martin, I think the argument I’d put forward for “Biographical Notes” being of equal worth to “Bright Morning” (which I do like) is that they’re trying to do different things. Ford’s story is primarily about that confusion of narrative identity – that’s the main interest. In Rosenbaum’s story the confusion of identity is worth a few gags, but it’s mainly a starting point for an attempt to explore (and re-invigorate) a classic genre story form, the pulp adventure. And with that … I think we’re done. It’s nice to end by agreeing about one story, at least! That was an enjoyable discussion, not least because I only just finished the collection myself! I guess I’d read over half of it already. For my part, I’d agree that “The House Beyond Your Sky” is the highlight, but I’ve enjoyed “Biographical Notes” the three times I’ve read it now, possibly increasingly as much each time. I don’t find it tiresome. I did find the metafictional asides in “Sense and Sensibility” enormously distracting, especially their faux-self-deprecatory nature, which is oh-so-postmodern in the way that, say, Dennis Potter was at his worst (and I greatly admire Potter at his best). I still found plenty to enjoy in that story. I think probably I do agree that Rosenbaum’s “flightiness” and uberpostmetafictionality gets tiresome over the course of the collection. I wonder if this is partly because that stuff is over-represented? For instance, I really like “Teardrop”, a story which is metafictionally referenced in “Biographical Notes”, but doesn’t appear in the collection. It’s Stross-Doctorow-style far-future stuff, and as I recall sticks pretty much to the sf genre, and maybe it was “too sf” for the collection. I’m not sure that there’s a lot of other non-collected Rosenbaum though. I vaguely recall a couple of others that aren’t in there… and maybe they don’t support my thesis. He does love a good bit of metafictional satire after all. “True Names”, his collab with Cory Doctorow in Fast Forward 2 is pretty out there too (I assume Martin would hate it :P – but I found it entertaining as a podcast and look forward to reading it in its final form). In any case, I do think Ben has an exciting future, and I always look forward to his stories. I have a copy of True Names so I will try and let you know. Pingback: Ponzi & Other Schemes : Not a journal.